Would you like to get closer to our Blessed Mother? There are some wonderful Marian Prayers that can help give us the graces we need for our salvation. These include such essentials as the Rosary, the Hail Mary, the Hail Holy Queen the Memorare, the Angelus, the hymns Ave Maris Stella, Tota Pulchra Es and the Magnificat (Mary’s canticle of praise for our Lord). Other Marian prayers are based on names given to Our Lady from her apparitions, or other such supernatural phenomena, confirmed by the Church. She has often appeared to humble people in small towns requesting that we strive to live in holiness and obedience to her divine Son. Thus, there are prayers to Our Lady of Good Counsel, Our Lady of Guadalupe, Our Lady of Lourdes, Our Lady of Knock, Our Lady of La Salette, and Our Lady of Mount Carmel, and to the Immaculate Heart of Mary among others! In addition, the events surrounding the appearances of Our Lady of Fatima have given us several good Fatima Prayers, including one that follows each decade of the Rosary. We are not required as Catholics to believe in these appearances, but the Church recognizes that belief in them does not run contrary to our faith. In fact, in many ways it can strengthen it! 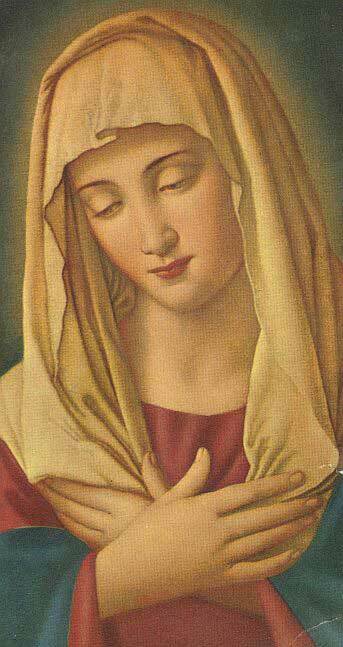 (Along these lines, we’d also like to recommend this site which can help you make a “Total Consecration to Jesus through Mary” through prayers and readings that take as little as 10 minutes per day. Theologians over the centuries have rightly observed that the Blessed Virgin Mary as Queen of Heaven has been given all of God’s graces to dispense as she sees fit to assist us in our road to Eternal life. In our prayers to Mary we appeal to her as the mediatrix par excellence in seeking her divine Son’s mercy and forgiveness for our sins. She can also help us persevere in our journey towards Eternal Life as well, especially during those times we feel anything but holy! St. Thomas Aquinas wrote that “as sailors are guided by a star to the port, so are Christians guided to Heaven by Mary.” Bishop Sheen marveled at how she “makes our prayers more bright and burning!” Feel free to approach her anytime for divine assistance in a spirit of humility, contrition, and love!